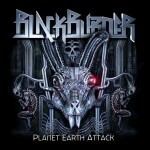 PLANET EARTH ATTACK, an exciting new meta-eclectic LP by Blackburner, is set for a release on September 25th on Cleopatra/Hypnotic Records. I had the distinct pleasure of obtaining a pre-release of this disgustingly dark–yet occasionally mesmerizing–album, headed by the former-metalhead Skyla Talon, who is ostensibly still enamored with the genre. …But it can also be really beautiful too. From the droning, distorted guitar-driven title track all the way to the Dance outro “Set this Fire,” Blackburner has a way with musical story telling that is sure to please the palettes of anyone who enjoys variety in their artists. The inaugural tracks lay down a foundation of power that is pervasive throughout the album, aside from some very catchy tracks sprinkled about that take a dramatic turn for the hypnotic, such as “I’m in Love with this City ft. Geri X.” Blackburner shows that there is nothing wrong for a group with a dark and disturbing image to have a soft side. But not for too long….they aren’t sissies. The excitement and haunting SFX grit continues with tracks like, “Time Travel” and “50 Grades of Space,” showcasing the groups genre-bending proclivity to tame chaos into something manageable. If you are looking for straight-forward Dubstep, you can check out the track “Electric Flesh,” a gritty and hectic piece. Otherwise, we suggest you allow Blackburner to take the helm and steer you in and out of their elegant melodies, wicked synths, and well-placed (but not overdone) bass wobbles. 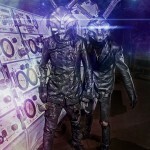 Taking a great deal of inspiration from goth-rock, track’s like “Burn Burn Burn” are seething with vocals influenced by the likes of Marilyn Manson and Rob Zombie, while others showcase the band’s affinity for Progressive-Rock, like “Comfortably Numb,” featuring vocal clips from Pink Floyd.